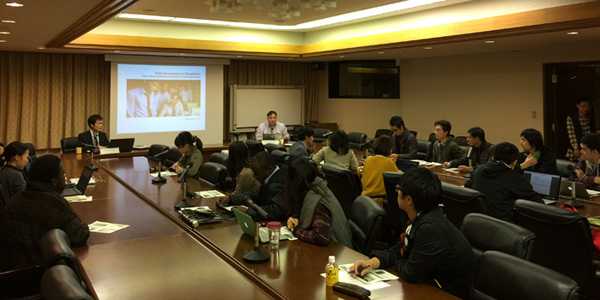 Development Management Policy Seminar on “Skills Development in Bangladesh: Findings from Tracer Study”was held in Kobe University’s Graduate School of International Cooperation Studies (GSICS) on November 25th, 2014. The speaker was Dr. Shiro Nakata who is an Education Consultant for the World Bank. In his presentation, Dr. Nakata gave an overview of the significant socio-economic development of Bangladesh since its independent in 1971 and skills development issues in the country. He also introduced the World Bank’s Skills and Training Enhancement Project (STEP) which is being implemented in Bangladesh, andshared the key findings from the tracer study on employment outcomes of short-term (ST) vocational training graduates. In the final part of theseminar, Dr. Nakata shared the results of the tracer study on ST vocational training graduates, for instance, the key characteristics and main groups of ST trainees, the effectiveness of ST vocational training on skills development, and its significance. He also shared his final thoughts regarding how to improve the quality of training and trainees’ skills development through enhancing the support to vocational trainings. The seminar was very informative and stimulating, as it broadened the vision of all the students who attended. During the question and answer session, the students asked a number of questions, aimed at understanding whether the ST vocational training are effective in promoting skills development. In general, the seminar provided students with the opportunity of broadening and deepening their knowledge and understanding in the field of vocational training and skills development.